Hollis Machala is a watercolor artist and home to New England. She is an award winning, Artist Member of the Rhode Island Watercolor Society. Her works are featured on her online store and she participates in annual art shows. Hollis offers a vibrant, fresh view; using the medium of watercolor to depict the texture and spirit of objects and places in still life’s and landscapes; using her graphic & interior design knowledge and travels as a guide to her paintings. Hollis received her bachelor’s degree in interior design from, the former, Mount Ida College in 2006. 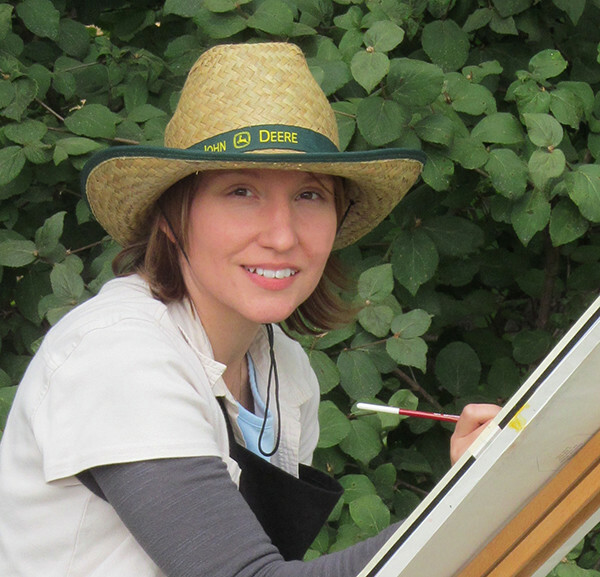 She began painting with watercolor after working and mentoring with Frank M. Costantino at his architectural illustration and fine art firm from 2007 to 2010. Hollis has since found and continues to craft her unique expressions with watercolor. Her work is included in private collections throughout the country. It is my mission to enhance life’s interiors with watercolor art. I use a subdued technique, with strong characteristic details that mark each painting as alive and fresh. I often use my camera as a way to see my subject in the window that will eventually become paper. I use it as a tool to view details, light, and textures that I want to enhance with watercolor. My intention goes beyond a realistic photo to applied paint technique. Each painting is a study of the textural and light essence of each subject which stems from its reality and unique character. I am drawn to and renewed by nature and food for my paintings inspirations. I think we all have a deeper connection to these sometimes overlooked joys of life.